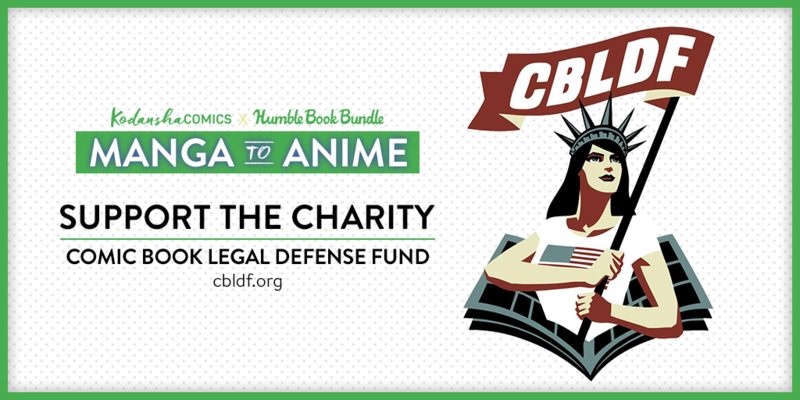 Discover the origins of your favorite anime and live action features with this massive manga Humble Bundle that benefits CBLDF! Instantly download over $800 worth of the groundbreaking Kodansha manga that inspired hit movies and TV shows, for a fraction of the price. It’s the last week to take advantage of this deal, so don’t wait – get your manga now! Kodansha Comics has joined with Humble Bundle to bring readers a huge cache of legendary science-fiction and fantasy manga that benefits Comic Book Legal Defense Fund! 80 digital volumes of the biggest hits in manga! Buyers pay what they want for manga hits that went on to become anime and live-action legends, including The Ghost in the Shell and Battle Angel Alita. Get it here! This bundle contains more than $800 worth of digital manga, or 80 complete volumes of manga that have gone on to be adapted into hit anime or live-action movies, including The Ghost in the Shell, Battle Angel Alita, The Seven Deadly Sins, Ajin: Demi-Human, and Inuyashiki. But rather than getting a discount on this epic collection, readers can pay what they want, starting at $1! Get 80 Volumes of Manga! This very special bundle ends WEDNESDAY, June 20, 10:59 A.M. PACIFIC TIME. Bundle buyers choose where their money goes — among Kodansha Comics, Comic Book Legal Defense Fund, and, if they like, another charity of their choice via the PayPal Giving Fund. If they like what Humble Bundle does, they can leave a Humble Tip too.